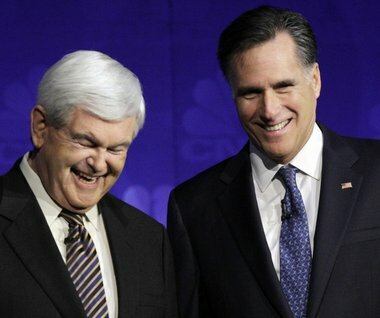 Newt Gingrich attacking Mitt Romney for speaking French? How gauche! I’m under no illusions about the weapons-grade insanity we’re all referring to as the Republican primaries this year, but a recent Newt Gingrich attack ad on Mitt Romney hit a particularly stupid note. Titled “The French Connection”, Newt puts the hammer to Mitt by tarring him with the Massachusetts liberal brush, but reaches for a curious case in point: He speaks French. Quoi?! For all Romney’s faults – the fact he is a money-mad robot, for example – picking his ability to speak French is trop bizarre, to say the least. Never the mind the fact Romney learned French as a Mormon missionary, and the clip they showed was a promotional video for the Winter Olympics he was organising in Salt Lake City. I mean, doing things, even speaking a foreign language, to keep Jesus and the investors happy is very Republican indeed. Stranger than the line of attack though is the man carrying it out, the man who is to hypocrisy what Jeff Gordon is to NASCAR, Newt Gingrich. Newt did his doctoral thesis on education policy in the Belgian Congo, a field of study which requires, to say the least, un petit peu de Français. And he carried out his studies in New Orleans, where not knowing French would be like going to Conemara without a cúpla focail. “A Massachusetts moderate cannot beat Barack Obama”, claims his attack ad, but neither can an arrogant Georgian blowhole. Maybe it’s my Irish aversion to pomposity talking, but I’ve always found American exceptionalism to be an extraordinary dumb concept, especially in the way articulated by the American right and stoked and pandered to by their leaders. Not just Gingrich but throughout the campaign Romney, Perry and most of the rest have all smugly articulated their “The way I love America is the only way to love America” views, like hipsters without the massive headphones or obscure band t-shirt, claiming with varying degrees of falsehood that President Obama apologises for America and such. It’d be laughable if it wasn’t so dangerous. Being proud of your country is not necessarily a bad thing, but thinking your country is blameless, infallible or exists on a higher level just because is plain stupid. Worse yet, blasting your opponents – or even people who articulate basically the same thing differently or more moderately - is the mark not of a citizen of a great country, but of a barbarian. Americans have of course not been the only transgressors on the world stage when it comes to coarse, unthinking nationalism and have a lot to be proud of too, but a country that purports to be the greatest ever should really have more class and grace. It may be easy to rip on France or Europe in general, but we’re a continent of culture, history, diversity and broad horizons. The French have a saying: “Qui n'entend qu'une cloche n'entend qu'un son.” He who hears only one bell hears only one sound. High-handed would-be leaders like Newt and Mitt would do well to listen to some of the voices of the people who reside beyond their coasts. They’d also be well advised to take heed of a phrase common round the part of the country I came from: Wind yer’ neck in.